Lake Baikal is situated in one of a series of rift zones, that began to form over 30 million years ago during the Tertiary (Belova et al, 1983). Although the lake has changed shape considerably through geological time, it is thought to be by far the oldest lake in the world. Geological timing of the formation of all basins, and their subsequent deepening is still under debate and is reviewed in Kozhova and Izmesteva (1998). Today, Baikal occupies the world's deepest continental depression, at 1164 m below sea level and is made up of three large basins (graben) of differing ages (Kozhov, 1963; Figure 17.1). The basins are separated by two underwater highs: the Selenga Shallows in the south, and the Academician Ridge in the north. The rift valley is currently expanding at a rate of c. 2 cm a-1, and is associated with intense seismic activity (SB-RAS, 1996). Only c. 140 years ago, over 200 km2 of land sank below the water surface, forming what is now known as Proval Bay, near the Selenga delta (Galazii, 1991). Lake Baikal itself is surrounded to the east and west by large, steeply sloping mountain ranges (horsts), broken only occasionally by valleys and deltas. These belong to some of the larger rivers, such as the Selenga and Upper Angara, whilst others are preserved from, for example, Pleistocene events. Although in area Lake Baikal is only the seventh largest fresh-water lake in the world, its great depth means that it contains the largest volume of surface fresh water (23 015 km3) (Kozhov, 1963). A total of 365 rivers flow into Baikal, and there is only one outflow, the Angara in the south basin. The largest inflow is the Selenga that has its source in the Mongolian highlands; this delivers just less than 50 per cent of all water to the lake. General morphological physical characteristics of the lake are summarized in Table 17.1 (Kolokoltseva, 1968). 1. The central zone, which includes the lake and natural parks and reserves around the lake. 2. 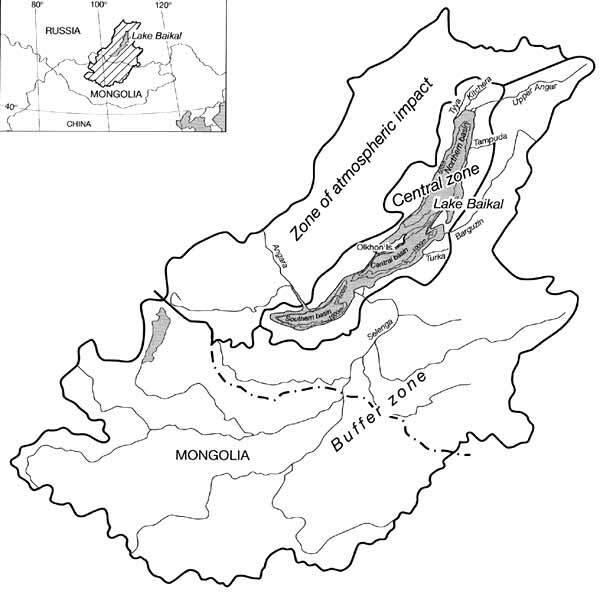 The buffer zone, which includes the rest of the physical catchment area both within Russia and Mongolia. 3. The zone of atmospheric impact, which occupies an area immediately outside the physical catchment area to the west and north-west of the lake. The Lake Baikal Region exists at the junction between several biogeographically distinct regions (i.e., Central Asian, eastern Asian, and European-Siberian, consisting of combinations of taiga, tundra, steppe and high mountainous deserts), and consequently has extremely diverse communities of plants and animals (Kozhova and Izmesteva, 1998). Over 2500 vascular plants can be found in the Lake Baikal Region, of which it is estimated about 10 per cent are endemic (SB-RAS, 1996). 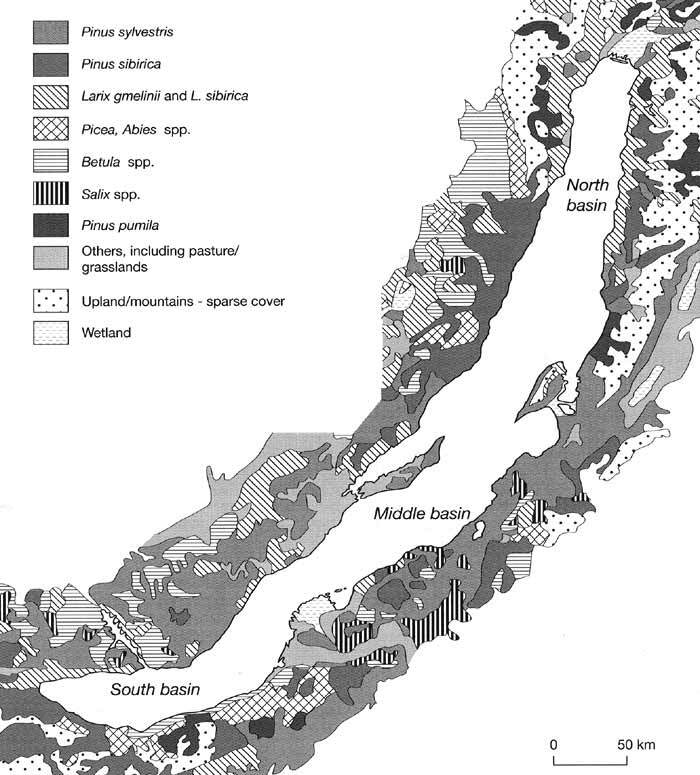 Major regions of vegetation immediately surrounding the lake are shown in Figure 17.2. Taiga forests are dominated by pine (Pinus sylvestris), larch (Larix sibirica), cedar (Pious sibirica), and fir (Abies sibirica), together with an understorey of various shrubs and grasses. Steppe vegetation is characteristic of the dry Mongolian steppes, often showing a degree of desertification. In the highland zones tundra predominates, although peat is common in depressions and highland plateaux. Near the lake shore, terraces in the north support Larix gmelinii and Rhododendron dahuricum, whilst in other regions extensive areas have been cleared of trees and summer dwelling has proliferated in recent years. Subsistence agriculture is commonly practised by numerous small communities on the shores on parts of the southern and middle basins. The eastern shore of the northern basin is least populated and here dense woodland extends to the lake shore, especially Pinus pumila and Betula папа. Local terrestrial faunal populations are even more diverse and include some 90 species of mammal, 400 bird species, 20 species of reptiles and amphibians and, what is certainly an underestimate, 5000 species of invertebrates, especially insects and spiders (SB-RAS, 1996). Endemism is particularly common in the Baikal mountains, which also serve to act as a boundary between western and eastern species. Interestingly, lakes other than Baikal within the Lake Baikal Region, contain an impoverished fauna (e.g., fish and invertebrates), perhaps because of past and present severe climate conditions (Kozhova and Izmesteva, 1998). On the other hand, many of these lakes contain relict animal species (Kozhov, 1963) and plants, including algae (Flower et al., 1998).